China's e-commerce giant Alibaba is launching its first online marketplace in the US - 11Main.com - as it looks to expand its operations outside China. The move comes ahead of Alibaba's share sale in the US, widely expected to one of the biggest by a technology firm. Alibaba is China's biggest online retailer. The total value of goods sold on its platforms last year exceeded that on Amazon and eBay combined. The portal 11Main.com will initially be open to customers by invitation only. "We want the shops to represent the diversity of Main Street. Some shops are high-end boutiques and some are more vintage,'' said Mike Effle, president and general manager of 11 Main. The site is being launched by Auctiva and Vendio, two of Alibaba's subsidiary companies acquired a few years ago. China's internet market has grown rapidly to become the world's largest with more than 600 million internet users. Domestic companies, especially those which were early entrants into the sector, have benefitted from its fast-paced growth. Founded 15 years ago by Jack Ma, Alibaba has gone on to become one the biggest internet firms in the world. It generated revenues of 40.5bn yuan ($6.5bn; £3.8bn) in the nine months to the end of December 2013, making a net profit of $2.9bn. Having tasted success at home, Alibaba has been looking to expand in overseas markets. Its moves will be watched closely by investors as well as competitors such as Amazon and eBay. However, Sucharita Mulpuru, an analyst with Forrester, said it was likely to be tough for Alibaba to break into the already-crowded online shopping sector in the US. "US e-commerce is crowded and relies on high marketing expenses to rise above the clutter," she said. "The hope is high. We'll see if they live up to expectations." But one of the vendors was hopeful the site would help her business attract new customers. "We've been struggling with the ability to reach a large audience being a small business," Tiger Bachler, owner of Alys Grace - business selling upscale clothing and accessories - was quoted as saying by the Associated Press news agency. 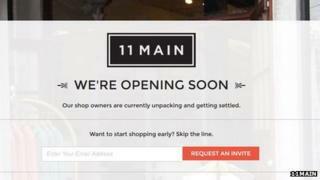 "We anticipate [11 Main] will be able to give us a wider audience with their marketplace expertise and marketing power."